Esbilac Puppy Milk Replacer Liquid is the top selling puppy milk replacer. It is recommended as a complete food source for puppies that have been orphaned or rejected, or those who are nursing, but need supplemental feeding. It has been enriched with essential minerals and vitamins to make it a complete diet. It can also be used to supplement dogs of all ages that have undergone stressful situation and are in need or a more easily digested source of nutrients. Add a Nursing Kit for easy feeding. Water, condensed skim milk, soybean oil, sodium caseinate, cream, calcium caseinate, egg yolks, DL-methionine, L-arginine, calcium carbonate, choline chloride, lecithin, magnesium sulfate, potassium chloride, monopotassium phosphate, salt, tricalcium phosphate, carrageenan, dipotassium phosphate, dicalcium phosphate, ascorbic acid, ferrous sulfate, potassium hydroxide, zinc sulfate, vitamin A supplement, vitamin E supplement, niacin supplement, calcium pantothenate, copper sulfate, maltodextrins, thiamine hydrochloride, pyridoxine hydrochloride, riboflavin, manganese sulfate, vitamin D3 supplement, potassium citrate, potassium iodide, folic acid, vitamin B12 supplement, biotin. All puppies should receive their mother’s milk for at least 2 days, if possible. This colostrum milk gives extra nutrition and temporary immunity against some diseases. Esbilac liquid may be fed at the daily rate of 2 tablespoons of liquid (30 mL) per 4 ounces (115 g) of body weight. The daily feeding rate should be divided into equal portions for each feeding. Puppies’ needs vary and this amount may have to be increased or decreased, depending on the individual. Small or weak puppies may need to be fed Esbilac liquid every 3 to 4 hours, while larger puppies do well when fed Esbilac liquid every 8 hours. Weigh the puppies daily to assure adequate feeding. Consult your veterinarian for additional advice. Not for human consumption. Esbilac liquid should be fed at room or body temperature. When a food supplement is desired for growing post-weaned puppies, show dogs and old or convalescent dogs, mix Esbilac liquid into the daily ration at the rate of 2 tablespoon (30 mL) per 5 lbs. (2.2 kg) of body weight. 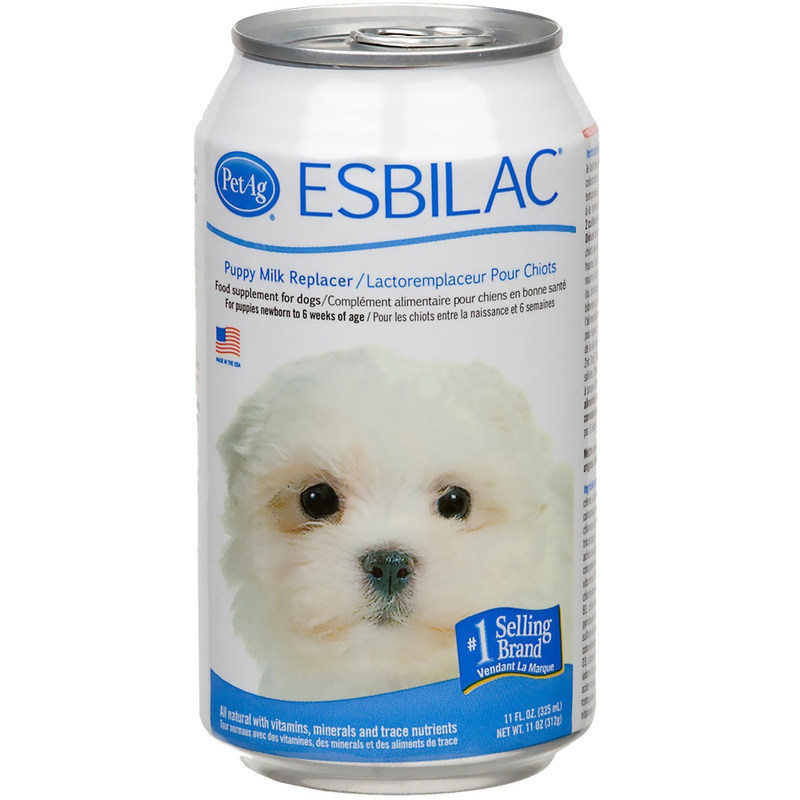 PREGNANT AND LACTATING DOGS: Mix Esbilac liquid into the daily ration at the rate of 2 tablespoons (30 mL) per 5 lbs. (2.2 kg) body weight. Shake well. Refrigerate after opening. To assure freshness discard or freeze within 3 days. Do not freeze in original container.